A Southern Grace: hot diggity dog! I'm giddy with excitement about these cookies, folks. At first nanosecond-long glance, they totally look like real hot dogs, right? The truth is that they're sugar, fat, and flour, my holy trinity. The bun is made using sugar cookie dough, baked up in an oblong shape with a dent down the middle. The dogs are made of red buttercream frosting and the mustard is buttercream frosting colored with a lot of yellow and a teensy bit of brown. The onions are simply flaked coconut. Aren't they cute? Credit to Jessie of Cakespy for the idea! Position a rack in the upper third of the oven and heat the oven to 350°F. Line two rimmed baking sheets with parchment. In a large bowl beat the sugar, butter, shortening, and salt on medium speed until light and fluffy, about 1 minute. Scrape down the sides of the bowl. Add the egg, corn syrup, and vanilla, and beat at medium speed for a total of 1 minute. In a medium bowl, whisk the flour, baking powder, and baking soda to combine; then add to the mixer. Mix on low speed for 30 seconds, just to combine. Scrape down the bowl and then mix on medium-low speed for another 30 seconds to mix the dough uniformly. Gently roll the dough into ovals of about 1/4 cup each. Roll the balls in sugar, then lightly press a dent into the middle of each log with your finger. Arrange at least 2 inches apart on the prepared baking sheets. Bake until the edges are golden and the tops are cracked but not completely set, 13 to 15 minutes. Let the cookies cool on the sheet for at least 5 minutes before transferring to a wire rack to cool completely. They are so cute!!! They almost make me want to try my hand at baking. Oh my! They are absolutely adorable Grace! I thought they were 100% real hot dogs! What a cute idea. I'm going to try this. It reminds me of Top Chef Just Desserts Season 2 when they had to make a dessert look like a savory dish. I'm bringing these to the next barbecue we're invited to, what a great idea! fell in love with them when I saw them. I was totally fooled when I first clicked on your post! These are so cute. Love this idea! They look cute and delicious! Okay, I really did think these were hotdogs! I was like hmm that's weird...:) They are super cute! Oh my gosh I'm making these for sure! I just love them! Thank you for such a fun post. My boys will die over these. Love them, love them! And so will my husband who could realistically eat hot dogs every night for dinner (as the main fare) if I let him. I'd be giddy with excitement over those cookies too! I can't wait to try them. Yes, I saw it on her blog: what a great & cool idea, right?? That is so fantastic! I wanna make them right now! Maybe with some pizza themed ones too..
You are so awesome! My kids would flip over these babies. Very cute Grace- my daughter asked me to teach her how to cook this summer- these will go on the list! Thank you!! These are so cute - and perfect for summer! Could these be any cuter??? Oh my goodness, I'm in love! Thank you for sharing and making my morning a bit sweeter! How fun--perfect for the 4th of July! these have to be the cutest cookies, perfect for the 4th!! You could have fooled me! Food art is so much fun and you've done such a super job with these cookies. Hot dog! They look REAL! Those are the CUTEST cookies ever! Amazing job, perfect for a summer picnic! Those are adorable Grace! I really thought I was look at hot dogs. How cute these will be at any food gathering. 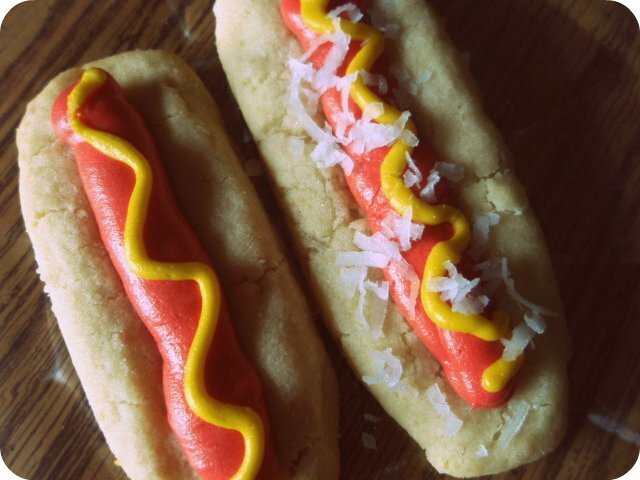 Grace these cookies hot dogs look amazing!! so cute!! These are as cute as can be! And, how perfect are they for summer bbq's? Very. Oh my goodness! These are adorable. I bet they would be a hit at any summer picnic, especially with kids! Oh you little kidder! Another one who has been fooled by these adorable hot dogs. These are adorable. They'd be a huge hit with kids of any age! Really really cute! :D maybe burgers next!! A great idea for a picnic with the kiddos! These would go great with those cupcake burger/sliders. I've made them and everyone always loves them. Next time I'll try these, too.